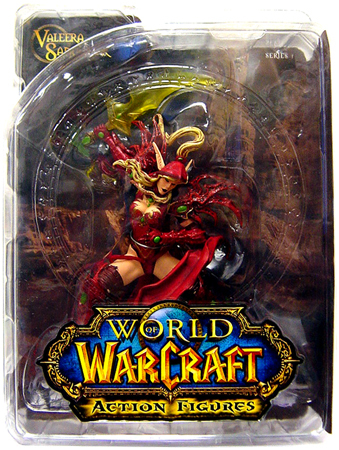 World of Warcraft [ WOW ] DC Unlimited Series 1 Blood Elf Rogue Valeera Sanguinar is already a WOW classic collectible! There is NO packaging condition guarantees on this item(due to the manner in which the manufacturer packed them! )For nearly seven thousand years, the high elves cultivated a shining magical kingdom deep within the forests of northern Lordaeron. But five years ago, the undead Scourge invaded Quel Thalas and drove the elves to the brink of extinction. Led by the evil death knight Arthas, the Scourge destroyed the mystical Sunwell, thereby severing the elves from the source of their arcane power. Though the scars of that conflict are evident, the remaining elves have banded together and retaken much of their homeland. Calling themselves blood elves, these grim survivors are committed to regaining the vast powers they once commanded. Inspired by the leadership of their beloved prince, Kaelthas Sunstrider, the blood elves now seek out new sources of arcane magic and the means of defending their land against the undying horrors of the Scourge. 7 inches high. Each figure features multiple points of articulation.